The reign of the Khmer Rouge regime in Cambodia was catastrophic for the nation's legal system. Most of the nation's judges, lawyers, and prosecutors were killed or expelled under the regime's rule, and courthouses became places of torture for the regime's political opponents. The rise of the Khmer Rouge meant the death of the rule of law in Cambodia, and the nation's legal system is still recovering from the devastation wrought by the regime today. The legal profession was deeply undermined at every level, with law books being burnt and courthouses being used for torturing political opponents. Legal professionals were virtually driven into extinction. Those arrested simply had no ability to pursue justice and were left in prison indefinitely. The lack of legal oversight increased the likelihood of torture at the hands of prison officials. 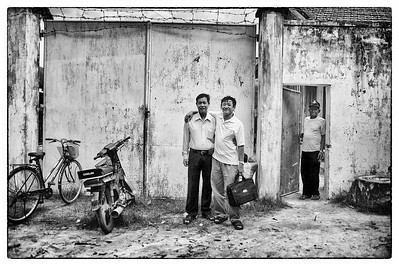 As a result, Cambodia continues to suffer from a significant shortage of lawyers and trained legal professionals to provide legal services to this day. 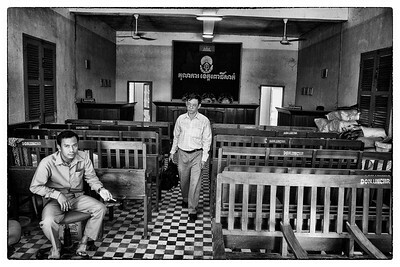 In 1994, a team of international lawyers (including IBJ founder and CEO Karen Tse and IBJ Board President Francis James), arrived in Phnom Penh and trained the first cadre of public defenders, at a time when there were fewer than ten lawyers in the entire country. The country benefited tremendously from this outpouring of international attention and shortly after the ten-month training, public defender offices were set up. Soon the organizations Cambodian Defenders' Project (CDP) and Legal Aid of Cambodia (LAC) were formed. Unfortunately, the wane of international interest and funding in the Cambodian legal system threaten the continuity of the work done so far. With a population of approximately 14 million people, and resident legal aid offices in only 14 of 24 provinces, the Cambodian people are severely lacking in access to justice. While there are criminal justice NGO groups active in every province, many of them focus on assisting mainly women, children or specific types of cases (e.g. land owner rights). 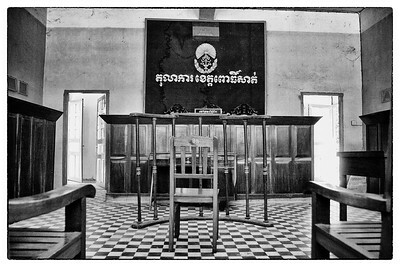 Without adequate legal representation, Cambodians are more likely to languish in prison longer than the law allows. The use of torture also rises dramatically in correlation to the amount of time spent in prison. 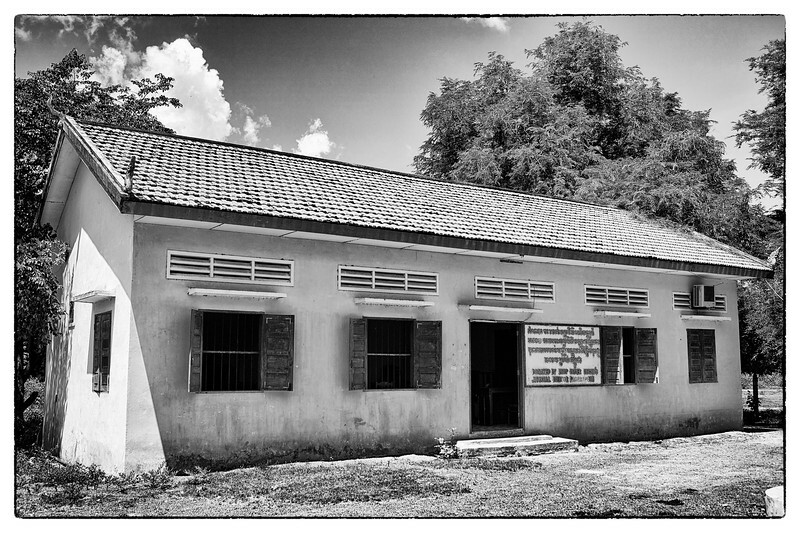 By training local lawyers and focusing our programming on the development of legal aid services for the entire country, IBJ is striving to help rebuild the legal infrastructure to give each and every Cambodian the access to justice that they are entitled to in law. Since 2001, IBJ has been helping Cambodia to rebuild its justice system through a partnership with Legal Aid of Cambodia. International Bridges to Justice is an independent, non-profit and non-governmental organization founded in 2000 that strives to protect due process and achieve fair trials for the accused throughout the world. In countries where governmental commitment to human rights principles has, as of yet, failed to meet its practical goal, IBJ fills the gap between human rights legislation and domestic implementation. Currently operating in China, Vietnam and Cambodia, IBJ has just recently launched projects in Rwanda, Zimbabwe and Burundi. In response to urgent requests, we are also expanding initiatives to reach other parts of the world. We envision a world without torture or unjust legal proceedings, and we work every day to achieve this end. 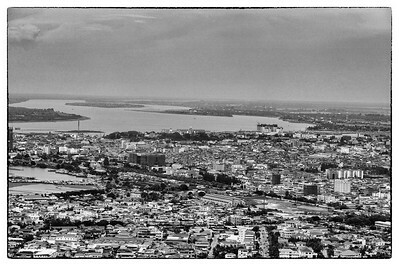 Phnom Penh, the capital city of Cambodia, is home to 2.2 million along the Mekong river. Ouk is the only IBJ lawyer in Cambodia (2008). 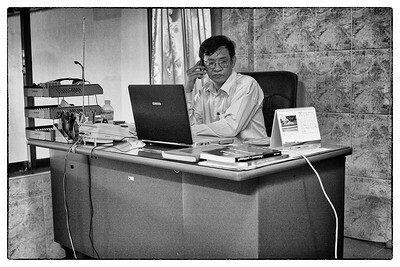 He works in a simple and stark yet modern office by Cambodian standards. 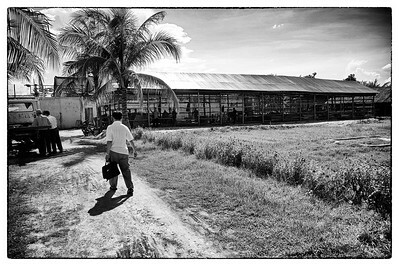 Ouk makes his way towards a prison in Pursat. He visits prisons to identify and interview prisoners that are languishing in prison without access to a lawyer. 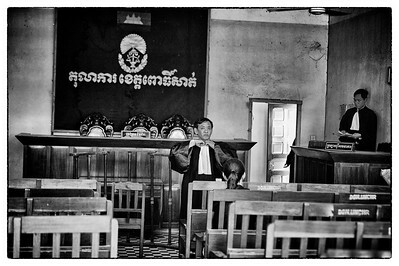 Most Cambodians can't afford a lawyer. He finds many more cases than he can handle. Poverty is compounded when a man or woman is arrested and sits in prison for months and years awaiting a trial as the family, usually living day by day, loses an income. Prisoner's families must also spend money and time bringing them food, as none is provided. Guards monitor prisoners in an outdoor woodworking shop. Prisoners working in a prison wood shop in Cambodia. A prison entrance. Photographing inside was forbidden. Ouk and the head of the prison ask me to take a photo of them. Personal relationships are extremely important in places like Cambodia, where the rules and the "law" are much more flexible. 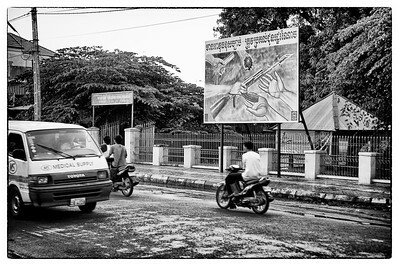 A sign asks citizens to trade in their weapons, mostly left over from the vietnam war and khmer rouge days. With few judges and few lawyers, and irregular salaries, most courtrooms sit empty. Paperwork starts to overwhelm the courtroom. 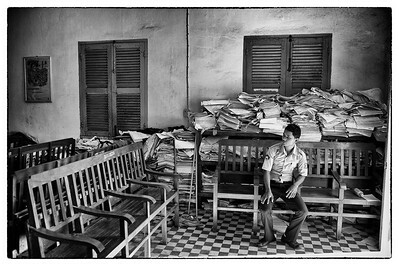 It struck me as a metaphor for how organized and efficient the current justice system is in Cambodia. Mao, a 19 year old Pursat resident accused of stabbing someone in a fight has been detained without council for over 6 months. Today, with pressure from IBJ, he was finally given a trial. However, his case was given an interlocutory judgement until key witnesses could be found and more investigation can be done. Mao will return to jail for an indefinite period of time, but this time with the knowledge that he has a defender working on his case and the justice system, albeit painfully slow, is in motion. 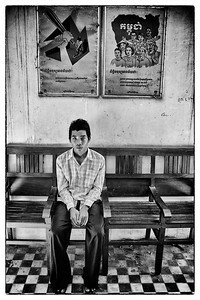 Mao waits for his trial. Ouk asks for a photo with Mao before the trial begins. Ouk dawns his robe in preparation to present his case. The judges ask that no photos be taken during the trial. Ouk leaves the courtroom after being told his client will go back to prison to wait for investigators to conduct more investigations....which could take months, even years. 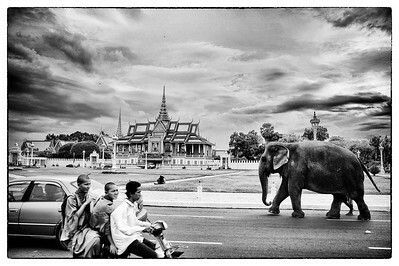 Ouk, like most Cambodians, shows little emotion and tells me that's just how it is. He's hopeful it Mao will be back here in less than 6 months. Posters in the courtroom. Many "confessions" are attained by police beating one out of the accused. 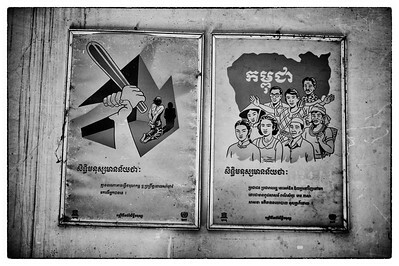 Cambodians, especially poor rural ones, do not know their rights. Families are at a loss when their loved one's go to prison, not knowing where to turn or what to do. This was the case for Mao as well. Ouk and IBJ are an unbelievable resource for them. 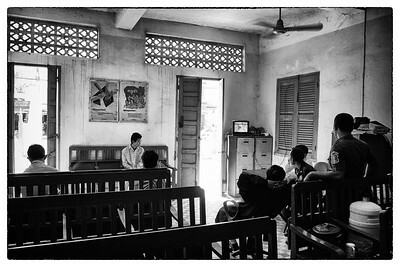 Lawyers and court officials watch a kung fu movie on tv after the first hearing of 19 year old Mao. He waits, handcuffed, after his first hearing since he was thrown in prison a year ago accused of (not charged with) petty theft. With no lawyer, no power and no money to informally speed up the process, he waits. 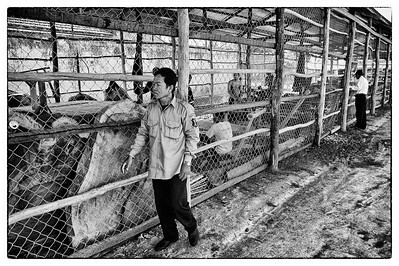 An NGO, International Bridges to Justice, works to fix this situation by finding and representing those languishing in prison like Mao. Today's verdict is more waiting...an indefinite return to prison while more investigations are done. 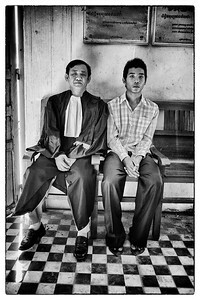 All too common in Cambodia, where with no money, few lawyers and fewer judges, justice comes slowly if it ever comes at all. 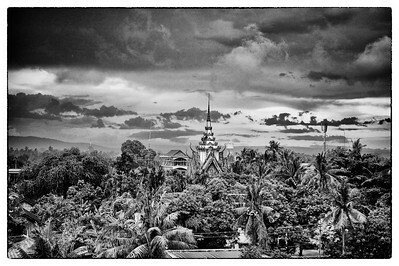 Most of Ouk's clients are found languishing in rural Cambodia. 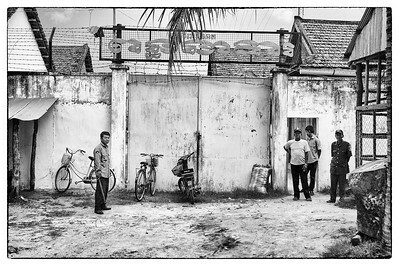 Some provinces have only one lawyer and most Cambodian families can't afford to hire them. Rich families can hire the lawyer and pay bribes to get their case heard quickly and effieciently. 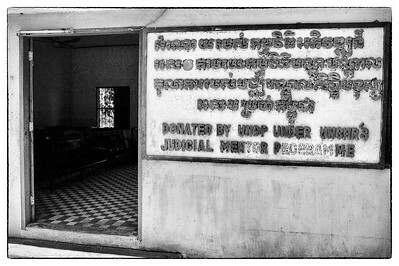 A typical courtroom in the provinces outside of Phnom Pehn, built by the UNHCR after the Khmer Rouge were toppled.